Hermann Hagedorn died fifty years ago today. The name may not ring many bells within the general populace. Hagedorn, however, was a towering figure within the world of Theodore Roosevelt memory and historiography. 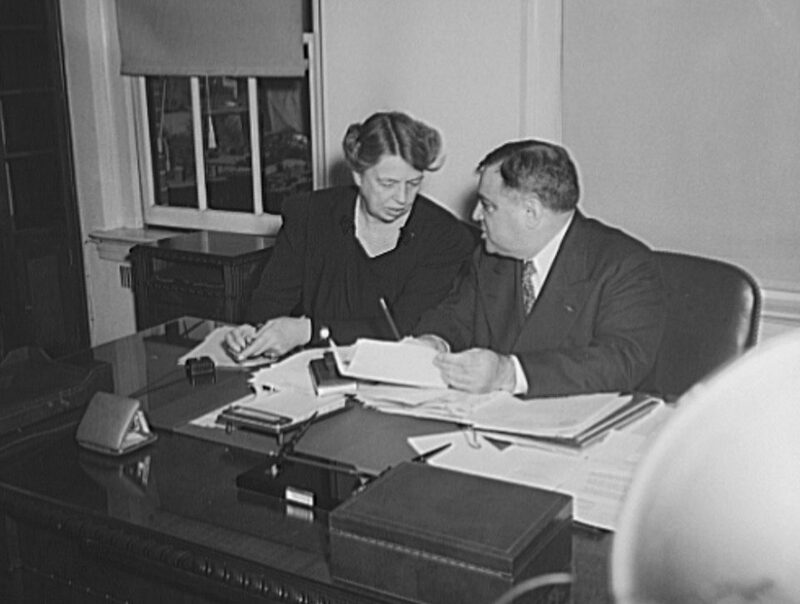 When the Roosevelt Memorial Association was formed weeks after the former president’s death, Hagedorn became the group’s first acting secretary. He eventually became the RMA’s executive director. Hagedorn dedicated a significant portion of his life to the Roosevelt legacy; the RMA formed in 1919 and Hagedorn was still going strong during the Roosevelt Centennial in the late 1950s. Hagedorn met Theodore Roosevelt in 1916 when a small group of supporters were trying to convince him to make one final run at the White House. That of course did not come to pass. 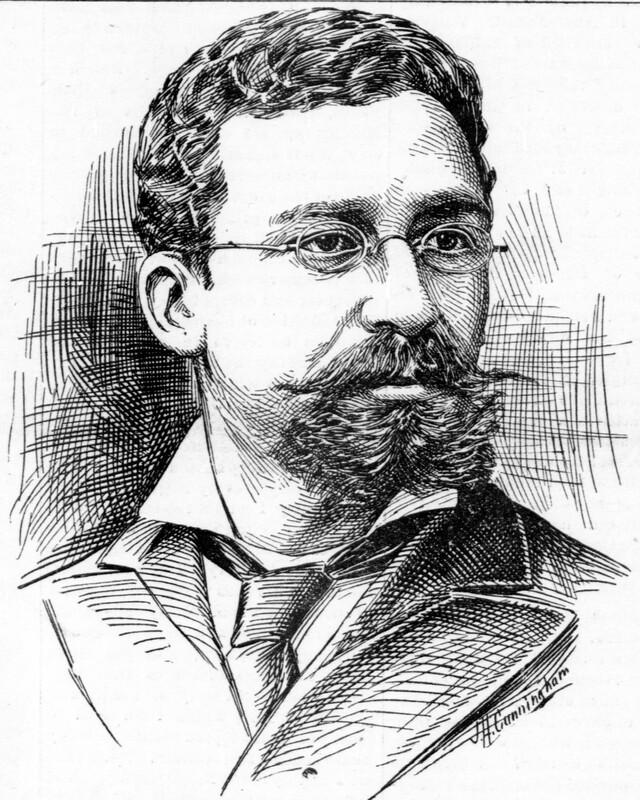 The son of a German immigrant, Hagedorn was born in New York City. Though the United States was not yet involved the Great War, the fighting was raging in Europe when Hagedorn and Roosevelt first met. One can see why they were drawn to each other. Roosevelt was advocating for Preparedness while Hagedorn was extolling the virtues of Americanism, especially with the German-American community. The Men’s and Women’s Roosevelt Memorial Associations were responsible for rebuilding Roosevelt’s boyhood home on East 20th Street. As I often emphasize on tours this was a time before presidential libraries. In addition to the house itself there was, and is, a museum and substantial library on site. Hagedorn claimed in the August 1929 Bulletin of the American Library Association that officials from the New York Public Library had told him that the Theodore Roosevelt Birthplace’s collection was “the most extensive library built around one individual in the United States.” The library indeed includes a substantial collection of books and other materials. It is worth noting that the Birthplace library collected not just photographs but moving imagery as well. This was pioneering stuff in the 1920s. The RMA and Hagedorn did a lot more than just the Birthplace though. They were responsible for constructing Roosevelt Island in Washington DC and transforming Sagamore Hill into the historic site it is today. These are just a few of their accomplishments. 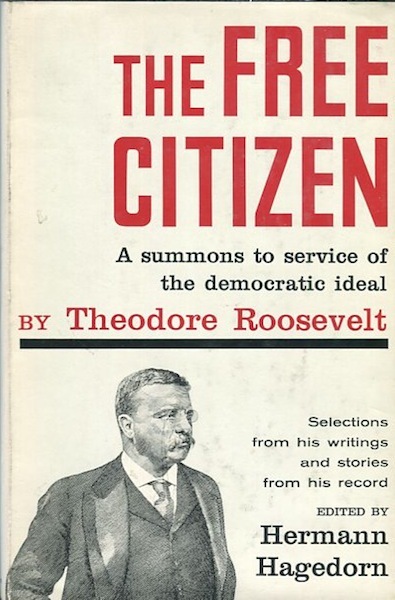 Hagedorn wrote a number of biographies of Roosevelt written for children and adults. He authored his first Roosevelt biography, The Boys’ Life of Theodore Roosevelt, in 1918 while the former president was still alive. In the mid 1920s Hagedorn edited Roosevelt’s Complete Works, a substantial undertaking given that Theodore Roosevelt authored over thirty books. Some people believed that Hagedorn became too involved in the Roosevelt legacy and that he sometimes stepped over the line into idolatry. Lewis Mumford and Oswald Garrison Villard were two of Hagedorn’s harshest critics. Hagedorn did sometimes lapse into hagiography but some of the criticism was shrill and unfair. Hermann Hagedorn accomplished many things in his lifetime. There were plays, poetry, biographies of such figures as Leonard Wood and Albert Schweitzer, and other projects over his long life. Still, he is now most associated with the life and times of Theodore Roosevelt. So much of what Hagedorn did is still here today. 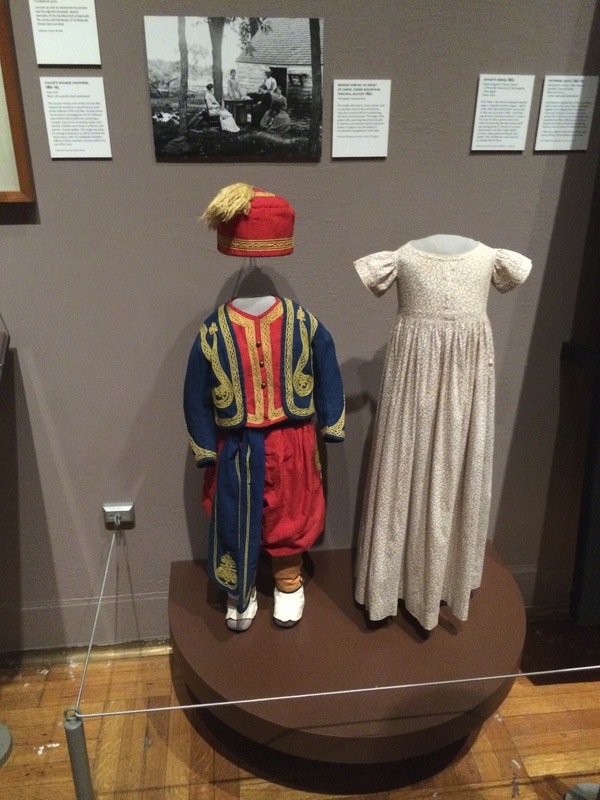 Yesterday a friend and I visited the New-York Historical Society to see the exhibit about textiles and the Civil War. Textiles, in this case cotton, obviously were a major cause of the secession crisis and the war. The exhibit though went beyond cotton’s role in the conflict. Included were quilts, flags, housewives (hand stitched sewing kits), clothes, and other items. Among the most touching artifacts were swatches from the Jordan Marsh catalog in various textures and shades of black from which to make mourning clothes. Jordan Marsh is yet one more thing from my past that no longer exists but that is another story. I do not know if this is true or not, but the exhibit states that there were no hidden messages within quilts for fugitives on the Underground Railroad. It’s funny how these types of stories get propagated and then never entirely go away. More than once I myself have readjusted what I say in tours and public talks after discovering a long-held assumption is false. One that comes to mind off the top of my head was that there was once a tax on having closets in one’s home. It is an extraordinarily thoughtful show and runs through August 24. Speaking of the New-York Historical Society keep in mind that the museum has an exhibit about New York City and the Civil War running through September 28 in Building 18 on Governors Island. I still have yet to check this out. 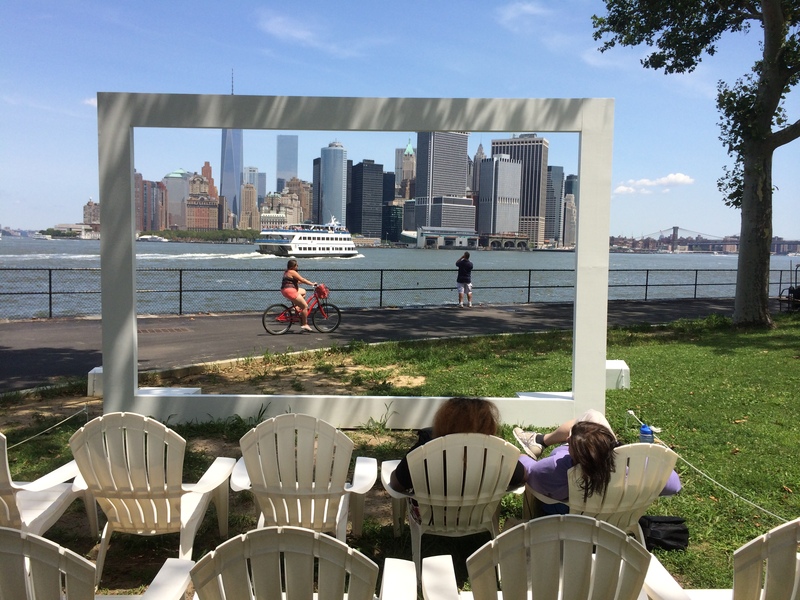 There is still two months to go in the Governors Island season. 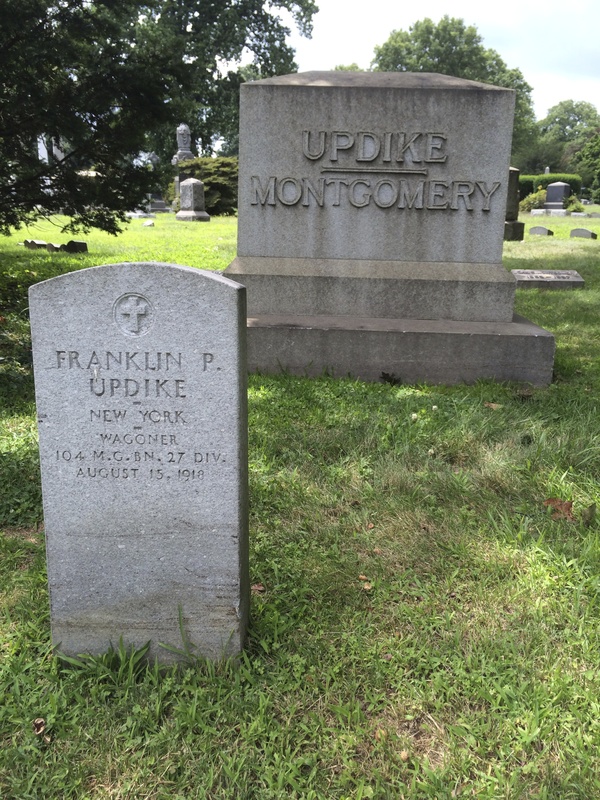 I was in Green-Wood Cemetery on Sunday when I came across the headstone of Franklin P. Updike. These WW1 headstones are much rarer than the ubiquitous Civil War markers one sees so often in old garden cemeteries. 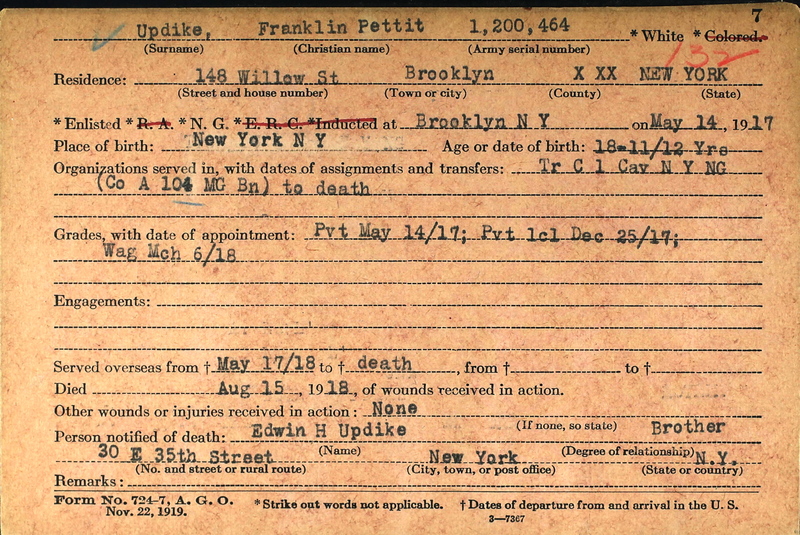 For one thing, there were fewer American deaths in the First World War than there were during the Rebellion. 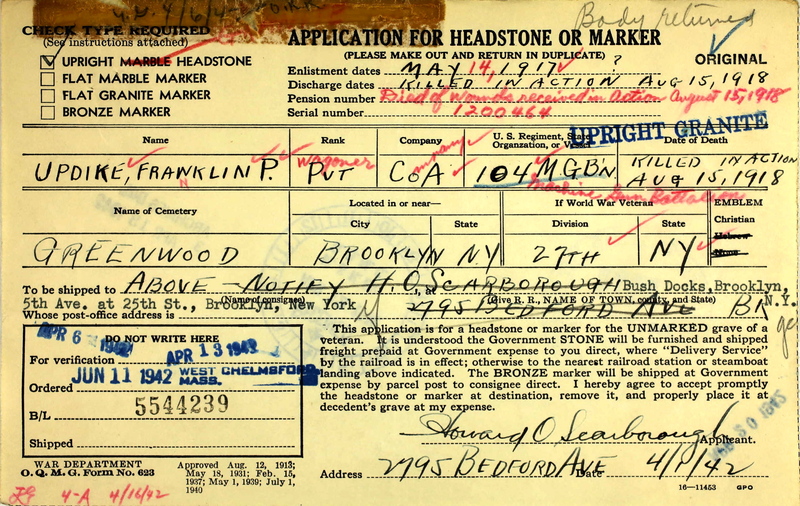 what’s more, a significant portion of doughboys were interred overseas where they were killed. This past Friday I was leaving Castle Williams after doing a tour when I noticed an art installation to the immediate left. 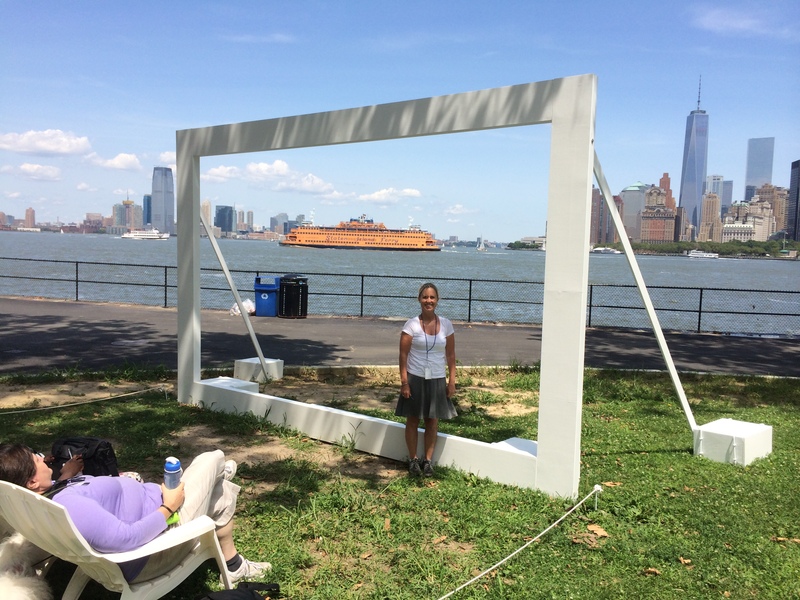 It turned out to be “Framing New York.” After a few minutes enjoying the view of the Harbor and Lower Manhattan, I struck up a conversation with the artist, D. Chase Angier. She graciously agreed to answer a few questions. 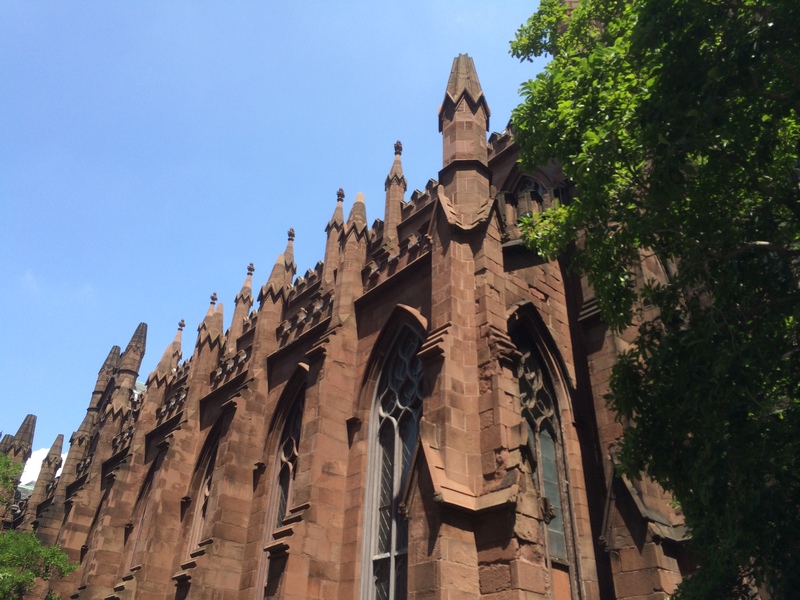 D. Chase Angier: From New York itself – the rapid rate in which it changes, its history, beauty, art, and stories. I have a deep love for this city as many of us do who have either grown up here, transplanted here, or even just visit. Inspiration for this project came from my complicated love for New York City coupled with my deepening concern for our future. What is New York City today and how does that reflect who we are and where we are headed? One of the elements that makes New York City unique is the unusually rapid rate at which it is changing. The rate of change coupled with the extreme density of buildings and people living in New York, creates an intense energy that is distinctive. 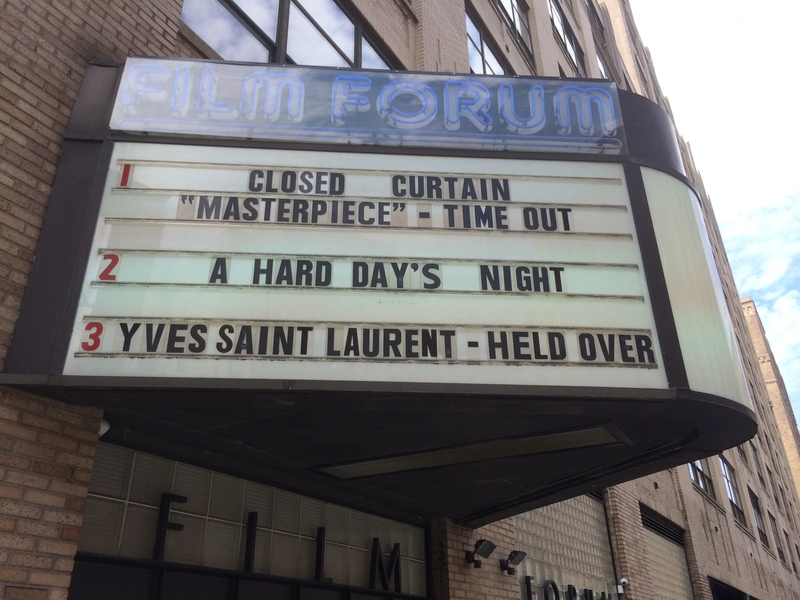 “Framing New York” asks the audience to pay attention together to one select place in New York City at a particular time. How would you describe your approach to your art? I have many different approaches to art but if I need to reduce it down to one thing, I am a site specific choreographer. D. Chase Angier in front of her creation. The orange boat is the Staten Island Ferry. I received my BA in Dance from UCLA and my MFA in Choreography from The Ohio State University. Basically, I am an interdisciplinary artist who specializes is site specific choreography. I am a dance professor and director of the dance program at Alfred University. I also create and perform site-specific performances, performance installations, dance-theater, and walking performances. My works have been performed internationally in Japan, the Czech Republic, Germany, Mexico, the United Kingdom and throughout the different regions of the United States. What other “Framing” projects, if any, have you done in the past? I framed Edgewood Farms, owned by Harold and Beverly Snyder in Alfred, New York. That was different in that it was a one time 2.5 hour event. The audience watched him hay his field. I placed ten matching white Adirondack chairs in front of the white frame for the small invited audience. The audience had to remain small and invited, in fact, because they were put on call to view this work. Certain weather conditions had to work together (wind, temp, humidity) to make it possible to hay on a particular day. The frame captured the shapes of the tall grass contrasting the cut hay, the tubular windrows, and the spiral “floor” patterns on the field. The lighting for the work was the sometimes indirect sunlight that filtered through the clouds creating interesting moving shadows, and the sometimes direct sunlight that not only brought out the gold color and the smell of the hay but also created the heat which added to the sensory experience. All of this activity happened against the beauty of the subtly changing landscape – the clouds, birds, cows, and hills. 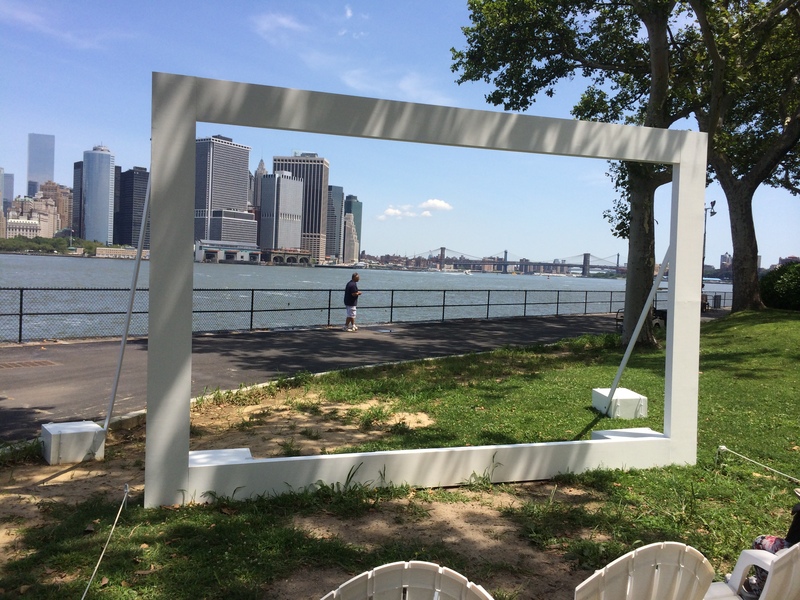 Had you spent time on Governors Island previously? Yes. I have been going almost every summer since it reopened. My favorite experience was the three day New Island Festival in 2009 with the Dutch. I enjoyed the art work, lectures, parties. It was three days of incredible madness. You mentioned in our conversation that the New York skyline changes depending on the weather, time of day, and other circumstances. Explain. Every day is dramatically different. The clouds, light, temperature, water traffic, people walking/biking by. The shadows crawling up the buildings – or no shadows at all on a cloudy day. How the light and sky reflect on the mirrored buildings, making some of them look as it they are disappearing. The dramatic dark thunder clouds versus a hazy hot light day. The color of many of the buildings change. The events change – Obama coming to NYC and landing close to Pier 11 as his military helicopters through the frame; the fireboat shooting out water the next day; the lack of people in the frame during the week on a rainy day, versus the crazy amount of people on the weekends. In addition to the light, color and sky – I have been fascinated by the choreography of the harbor. The different shapes, tempos, directions, rhythms, colors, size, levels, of all of the various boats. Tall ships, clipper ships, kayaks, repetitive orange staten island ferry, circle line, garbage boats, tug boats, oil tankers, jet skies, shark motor boats, cruise ships, etc. It is a participatory artwork in which people can sit in the chairs and watch the harbor and skyline. What has the public’s reaction been? So far extremely positive. My favorite part about New Yorkers is that they like to talk to strangers (me) and they like to tell stories. I had heard a lot of stories about 9/11 as they look and no longer see the twin towers. Firemen, construction workers, lawyers, financial analysts etc. Tourists have been moved as they are seeing the city live from a great perspective (across the water) that they have only seen in movies and photos. Skeptics, teenagers, and people not exposed to a lot of art have used the word “actually” a lot, as in “I actually like this”, “This is actually cool”, etc. 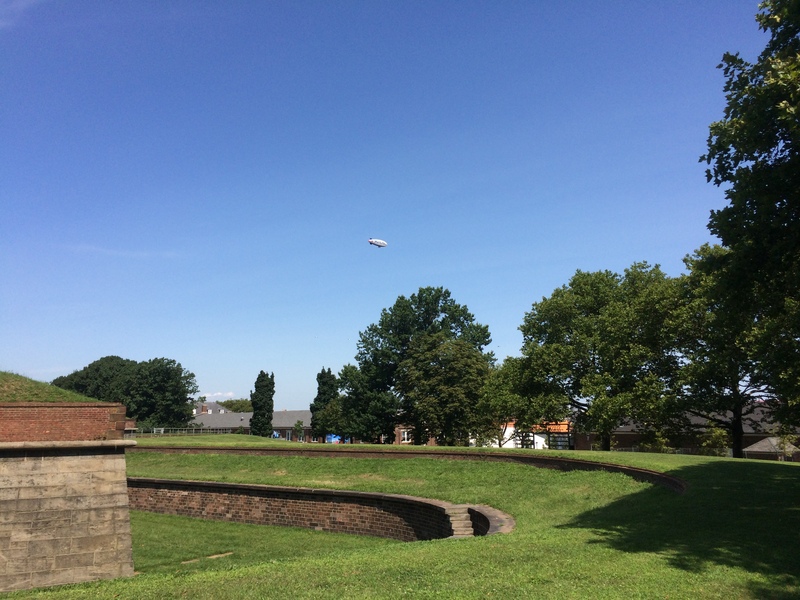 I was going from point A to point B on Governors Island this morning when I noticed the blimp floating above. That is Fort Jay and the moat in the foreground. Yes, it really was that nice out. What can one say in 2:00 minutes? I am sorry about the lack of posts recently. I have been so busy on other projects that something had to give. I have been making strides these past few weeks on the manuscript of the book about Theodore Roosevelt Senior. He was was quite the man. It feels good to be making progress. I promise to share as I get farther along. Here is something special. I first saw this add for a UK bread company years ago. Earlier today it popped up when I was searching for something else. My favorite part is when he comes across the 1953 coronation party for Queen Elizabeth, turns the corner and meets the Mod girls. The carload of blokes celebrating the 1966 World Cup victory is the icing on the cake. I am assuming the fireworks toward the end are for 2000 New Year Celebration. Wow, that was a long time ago now. Enjoy. 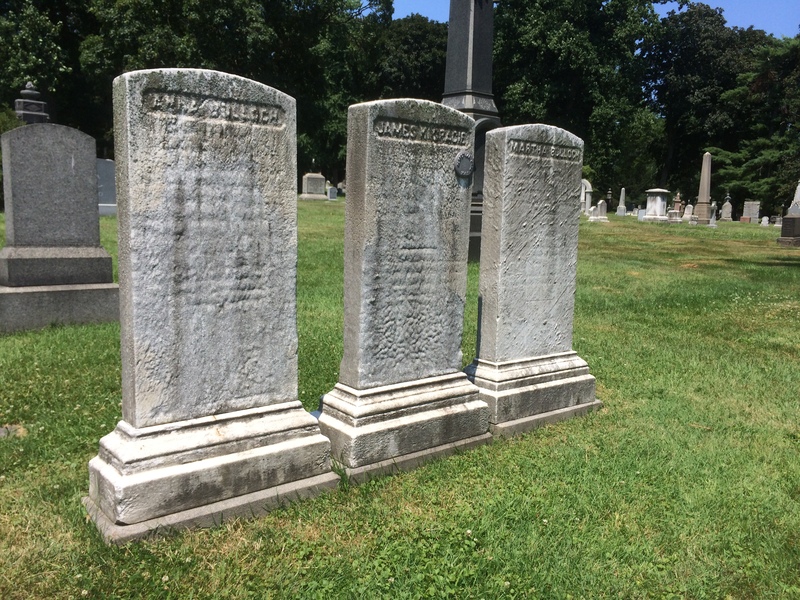 These now faded markers are the headstones of Anna Bulloch, James Gracie, and Martha (Grandmamma) Bulloch. Martha died in 1864 when the Civil War was still going on. 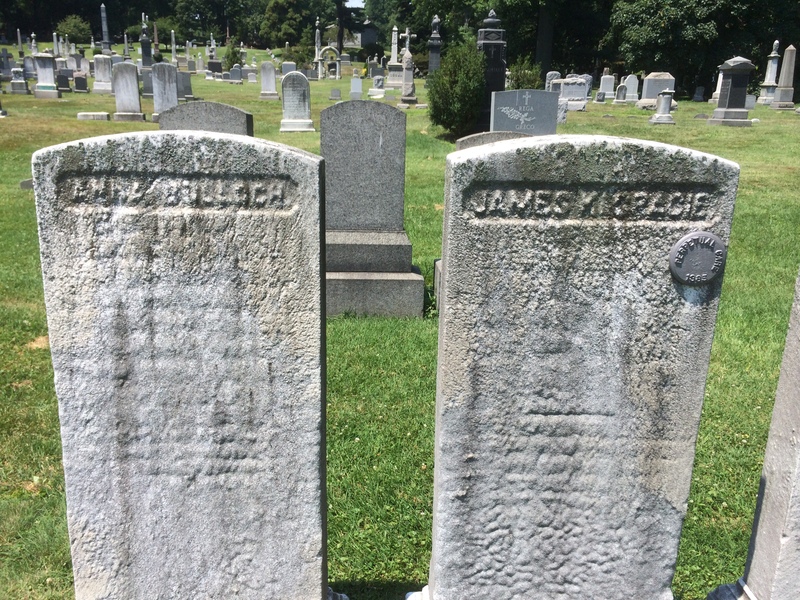 I was in Green-Wood Cemetery yesterday afternoon and came across the headstones of Anna Bulloch and James Gracie. I have seen these many times before. Anna was Theodore Roosevelt’s aunt, his mother’s sister; James was his uncle. James was part of the Gracie family that owned what we now call Gracie Mansion, the New York City mayor’s official residence. Theodore Roosevelt’s mother Martha was from Roswell, Georgia and married Theodore Senior at a young age. Anna and Grandmamma moved to New York and lived at East 20th Street soon thereafter. Anna home schooled Theodore and many other neighborhood children, including Edith Carow. I have always suspected that they moved to help Martha as much with the in laws as with the kids. In addition to her four children Martha had to contend with her in-laws living just a few blocks away on Union Square. 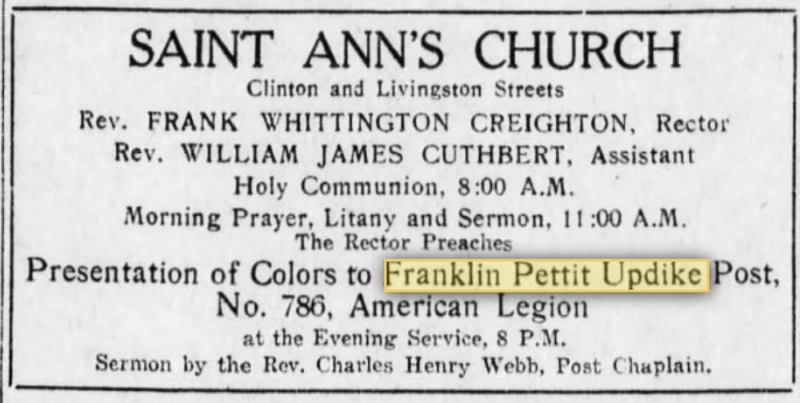 What’s more, she had four brothers-in-law also in the neighborhood, including one next door. It did not help either that the Civil War was coming and the Bulloch were staunch Confederates living and/or married into a family of Lincoln supporters. She didn’t have the buffer as Seinfeld would say. What has always intrigued me about these headstones is that Anna’s has her maiden name. I have never understood why hers says Bulloch and not Gracie. We know from the literature that theirs was a good and close marriage. James became very much a part of the Roosevelt extended clan and participated in the family’s charitable and other endeavors. 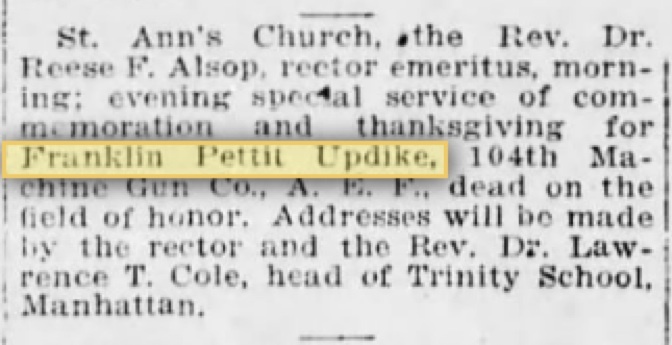 It seems strange to me that she kept the Bulloch name. I came across this sign up the street from our house and naturally had to stop and photograph. 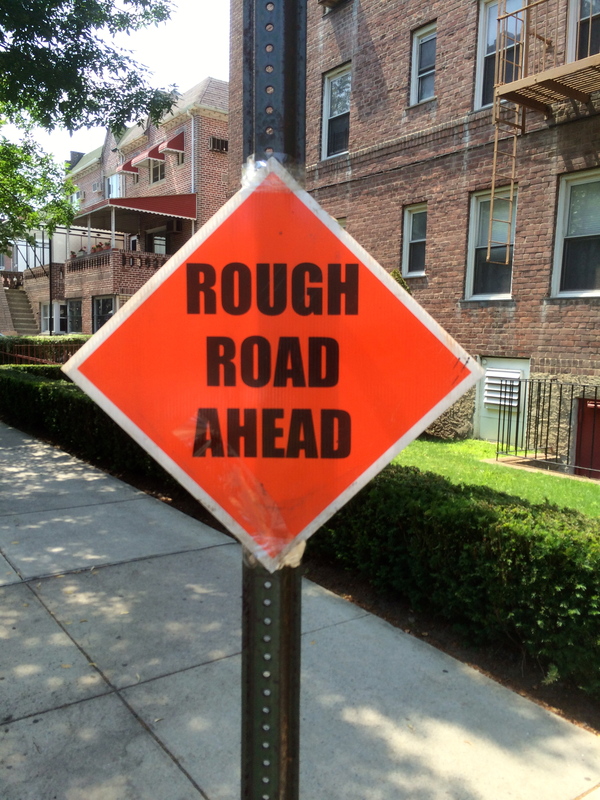 It is for the street work they have been doing, but feel free to interpret any way you wish.